The first new postwar design approved by Henry Ford II was the Sportsman convertible in 1946, which took the popular woody wagon in a new direction. The wood was structural, not just an applique and the bodies were built by Ford’s Iron Mountain works. Unlike the wagons, however, wood panels were attached to a metal frame, instead of a wooden one. The birch spars and maple panels added to the convertible’s weight and significantly to its price. At $1,982, the Ford Sportsman was 25 percent more expensive than an all-metal convertible and only 723 were sold. All had power windows and a power top. 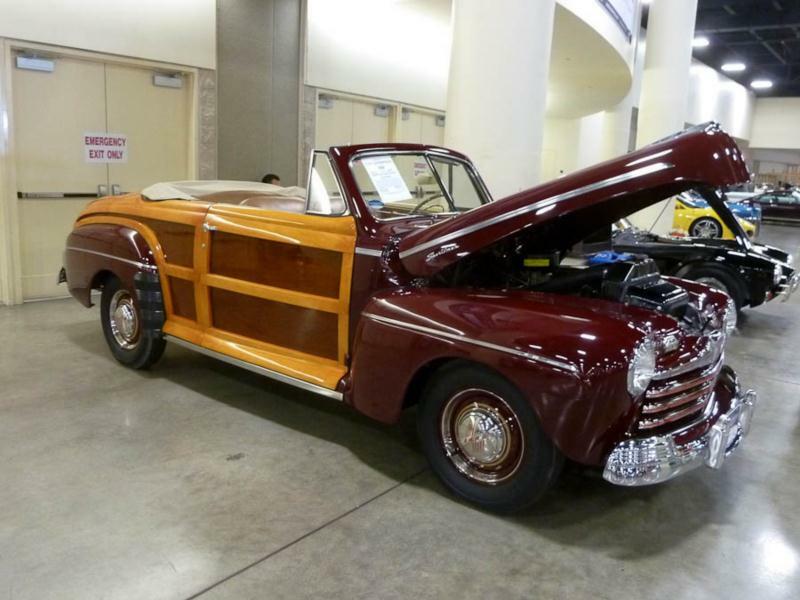 Putting it in perspective, Ford sold 16,990 woody wagons in 1946, at $1,553 apiece. The rarest Sportsman was the Mercury, only 200 of which were sold in 1946 – the model’s only year of manufacture. Both Ford and Mercury got the improved new 59A V-8 motor this year, with four-ring aluminum pistons, honed bores, a bigger oil pump, an aluminum timing gear, and nickel-chrome alloy valves – a result of wartime experiences. Fords changed very little for 1947 – parking lights moved from beside the headlights to below them and the grille lost its red stripe. Woodys remained very popular and the Sportsman rang up 2,274 sales this year- though that was only 10 percent of the sales of the all-steel convertible. At $2,282, the Sportsman was the first Ford to top $2,000 since the Model K of 1908. Once again, woody wagon sales stayed strong at 16,014 units. Ford, Chrysler and GM all introduced their first all-new postwar model designs for 1949, so 1948 was a short year, mostly shifting leftover 1947s. Only 28 Sportsman convertibles were sold in 1948 and the model would not appear in 1949. While 8,912 leftover woody wagons were sold in 1948, the model evolved into a two-door wagon for 1949 and a surprising 31, 412 found buyers. The 1946-48 Ford and Mercury Sportsman woodys are prized collectibles, whichever manufacturer sold them. Most people think first of the Chrysler Town & Country woody sedans and convertibles, but Ford Sportsman convertibles have a loyal following and now sell for substantial prices at auction. Maintenance is a constant concern with these cars, and annual re-varnishing of the bodies is strongly recommended. Factor in a convertible top, which is never watertight, and such a vehicle is intrinsically fragile. Make sure that at least the documentation is watertight, in any woody you fancy.